Since November 2013 I, white adoptive co-dad of two domestically adopted black children, started to document the daily news on adoption and adoption related issues. I searched the web not only for news, but for blog posts by adopted persons and first (or birth) mothers, since I believe that adoptive parents can learn more from the lived experience from them than from other adoptive parents, social workers, attorneys and agencies. Both resources I tweeted and in almost two and a half year I collected close to 11,000 links. I tried to refrain from twitter wars, but did not always manage, alas. On the other hand, I didn't try to be neutral. So I added here and there some 'anti-parent' and 'anti-agency' snark and threw in interjections like [OMG] or [Propaganda], when the perspective was too unabashed that of the self centered adoptive parent, cuddled by her or his agency or attorney in ignorance. Where do my children come from, how and why did they come to me and what will they think as adult adoptees, were my perspectives and sometimes the dark experiences of first mothers and adoptees ánd their forceful and un-sugarcoated wording of those experiences made me shiver and think. The adoption news in my tweets was and is very often somber, sad, was about failed adoptions, hidden identities, re-homing kids, mistreated first families, lack of belonging, closed or closing adoptions, God and child abuse, longing for the real self, child trafficking, baby buying and selling, racism and colorblindness, colonial attitudes, saviorism, poverty, drug abuse, murder and suicide. The happiest tweets concerned reunions of adopted persons with their first parents. Of course what makes the news is most of the time not good news, also in adoption news, but 4,000 sad tweets per year make, I think, a serious argument that something is not okay with adoption as child welfare instrument in the US. Like everybody else in the adoptive parent community I long time believed that adoption was a good thing that came with loss of course, but in the end was all around a beneficial child welfare intervention. I don't believe that anymore. I believe after 11,000 tweets adoption is in most cases a parent welfare intervention, an intervention often with disregard for first parents and their plight, with disregard for welfare solutions that could help children within their families and communities. Follow the money leads also in adoption to the truth: the truth that those who have the money define the narrative. Adoption as a privatized and commercialized social service is an American invention and started in its current form as a way to 'save' Korean orphans after the war. As in all good commerce the focus was on the paying users of the service and their wishes were central, not only in the organization of the work, but also in the promotion. The prospective adoptive parents were fed with images of sweet, sometimes adorably sad babies, and with slogans and stories that expressed the beauty and moral goodness of adoption. A whole pro-adoption speak was designed by the social workers of the agencies, and the often messy and panicky and heart wrenching abandonment and relinquishment of a child was repackaged as the courageous act of a first mother to make an adoption plan. The horrors of separating a child from its mother - most orphans were and are not orphans - were thus linguistically suppressed and the less successful adoptions were treated as unfortunate incidents, instead of considering both issues as systemic problems of the adoption intervention itself. Adoption gradually became 'normal' and when both the evangelical Christians and the gay community started to see adoption as a 'trophy' for their causes, albeit for different reasons, the industry as an uncontested morally good business became definitely established. It is of course already highly questionable for the ABA to rely for a book like this on writers who have a personal and financial stake in their presentation of adoption (and not on neutral academics) and who advertise themselves in the book as extreme reliable adoption lawyers (p.64), worse is that the ABA officially signed off on a business-driven, client-driven adoption narrative, which is by growing numbers in the adoption community seen as immoral. This narrative, which hides not only in the noun consumer but also in the gerund adopting in the title, this narrative for sure doesn't deliver justice for first parents and adopted people. Here two quotes from the book to demonstrate this point. "[T]he emotions in the [hospital] room [where mother and newborn are and meet with the adoptive parents] have the potential to be dramatic in that the birth parent(s) may well experience some sense of loss (or relief) and the adoptive family will be on cloud nine [...]." (p. 76). Some sense of loss, if you give up your child? Or even some sense of relief? Did the Kasky's ever talk with a first mother or first father? To tone the intense pain and lifelong grief down, is helpful for the adoptive parents, I imagine. Here the second quote: "Adoptive families have commented that it is somewhat unfair that they have to jump through certain hoops when others with far less in the way of education and/or resources can have a biological child without the slightest degree of training or preparation. We agree." (p. 57) We agree, say the bosses of an adoption agency, who seem to have missed all recent and not so recent literature on adoptees and identity and identity formation, on parenting the adopted child, on transracial adoption and so on and so forth, on - to summarize - the difference between the biological and the adopted child. Adoptive parents better prepare more intensely than biological parents for a not 'normal' child. It is not hard to find more examples of this normalizing consumer narrative: the whole book is one big example of that in itself. 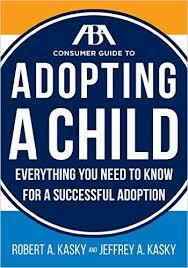 The ABA and the Kasky's will say that their consumer guide is indeed geared toward the adoptive parents. And there lies the deeper problem. A 'guide book' on adoption, even a legal book, can't these days be written ethically just by adoptive parents or the representatives for these adoptive parents: a book on the delicate and complex human enterprise that adoption is needs to be written or at least co-written by adopted people and by first parents with a focus on child welfare and not on business. Or better, the book should be about child welfare in which a chapter would be devoted to adoption. The Myth of Normal and Good is an adopters' myth. For the sake of our adopted kids - and for those who will be adopted in the future - we have to get rid of it as soon as possible. For starters, let's not buy The ABA Consumer Guide to Adopting a Child. Everything You Need to Know For a Successful Adoption. I already did, alas.